The Birds in the Air quilt block is an old favourite. I like it because of the geometry -- being the "math nerd" that I am. 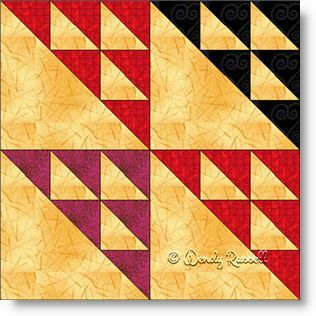 This four patch quilt block is made entirely of half square triangles, using two different sizes of those patches. You will be a master of this unit in no time when you make all the patches necessary for your quilt. You can do so many things with this block when you use it to make a whole quilt, as illustrated in the sample quilts shown. By simple rotations of the blocks, you can achieve all sorts of interesting arrangements, whether you choose a straight setting or a setting of the blocks on point. It is all yours to discover.